On August 23, 1776, the Virginia Gazette published by Purdie, ran this advertisement for runaway sailors. These five men abandoned the Virginia Navy's sloop of war Scorpion, Wright Westcott master. The Scorpion and her crew were later captured by the British in 1781, but saw quite a bit of running between the West Indies and the Chesapeake in that time. RUN away form on boar the Scorpion sloop of war the following seamen, viz. 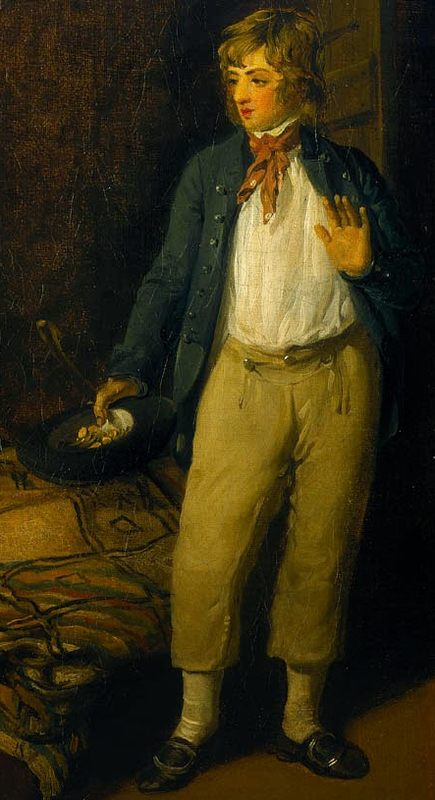 GEORGE PATTERSON, boatswain, a well set man about 5 feet 8 inches high, with brown complexion, short black hair curled around, and a snubbed nose ; had on a small round hat bound, a short blue jacket, and narrow trousers, and took with him the vessel's silver call. JAMES PARKS, a likely well made man about 5 feet 7 inches high, with brown complexion, and black hair ; he wears a cocked hat, had on a long blue jacket, and short wide trousers. 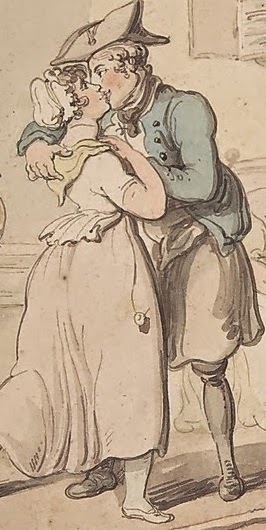 JOHN LOWRY, a stout, well made man, with a red face, light hair, and about 5 feet 6 inches high ; had on an old blue jacket, and old duck trousers. 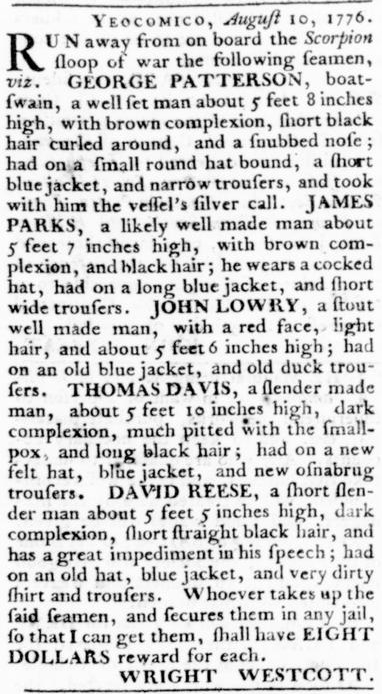 THOMAS DAVIS, a slender made man, about 5 feet 10 inches high, dark complexion, much pitted with the small-pox, and long black hair ; had on a new felt hat, blue jacket, and new osnabrug trousers. DAVID REESE, a short slender man about 5 feet 5 inches high, dark complexion, short straight black hair, and has a great impediment in his speech ; had on an old hat, blue jacket, and very dirty shirt and trousers. Whoever takes up the said seamen, and secures them in any jail, so that I can get them, shall have EIGHT DOLLARS reward for each. WRIGHT WESTCOTT. Much of this is fairly unremarkable. The clothing is exceedingly common. 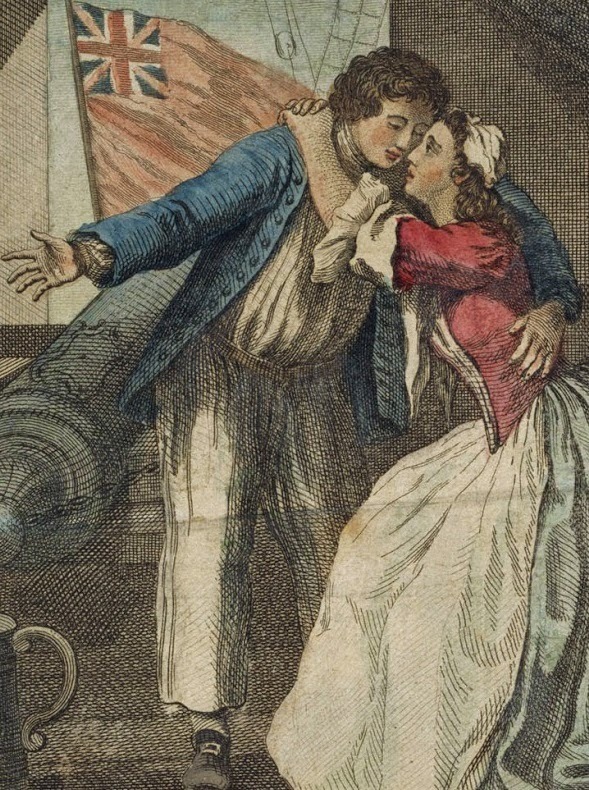 What is interesting is the numbers that fled, as runaway sailors are most often advertised for in ones and twos, and the fact that the Boatswain deserted! 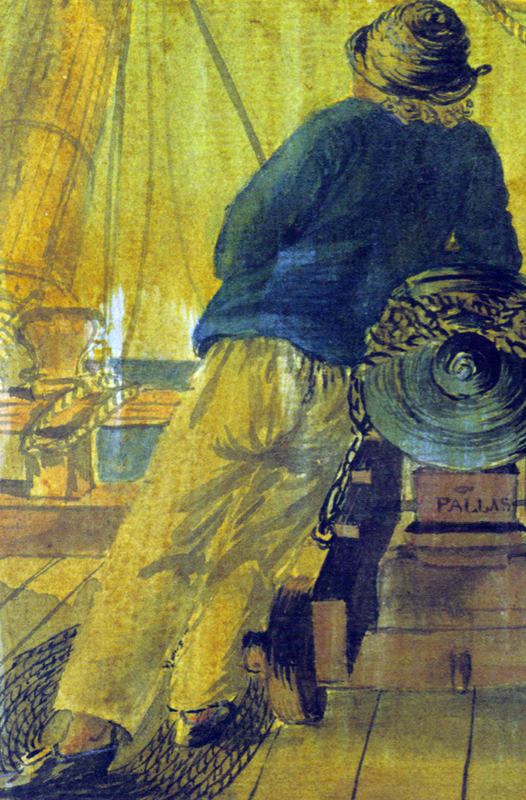 Patterson even took the bosun's whistle: the abovementioned "vessel's silver call." As something of an experiment, I will attempt to match the sailors to a contemporary image that matches their description, to give us a ballpark visual estimate of what this crew may have looked like. George Patterson - "small round hat bound, short blue jacket, and narrow trousers"
James Parks - "a cocked hat, had on a long blue jacket, and short wide trousers"
John Lowry - "old blue jacket, and old duck trousers"
Thomas Davis - "new felt hat, blue jacket, and new osnabrug trousers"
David Reese - "an old hat, blue jacket, and very dirty shirt and trousers"
Obviously, we don't know precisely how they looked. We don't know the material of most clothing they wore, and waistcoats go entirely unmentioned. Still, this collection of contemporary images, matched to the descriptions provided to us, might give us a ballpark visual estimate of what a crew may have looked like.